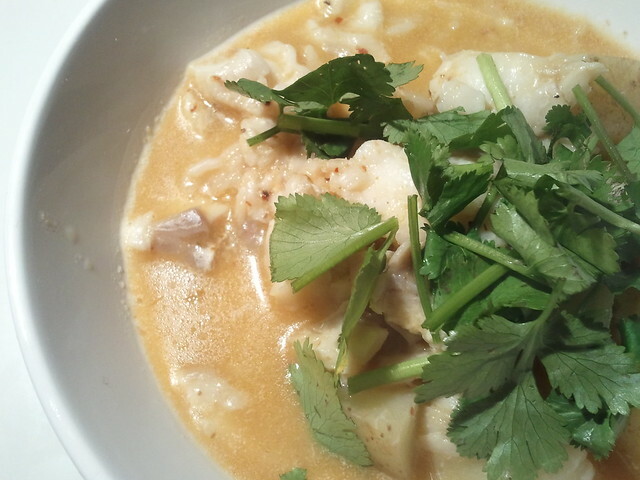 A few months ago Katharine The Sourceress very kindly cooked me and James B Marshall dinner, it was fab – Thai Fish Curry. Katharine kindly told me the recipe and one day I will create it properly but not today, today involved rain, two 2-hour meetings, crazy access right problems, several changes in specification and some sort of hideous problem with setting up the development environment. So today I made up a tribute to Katharine’s dish. Give it a taste – more curry paste? I thought so too, stick it in.